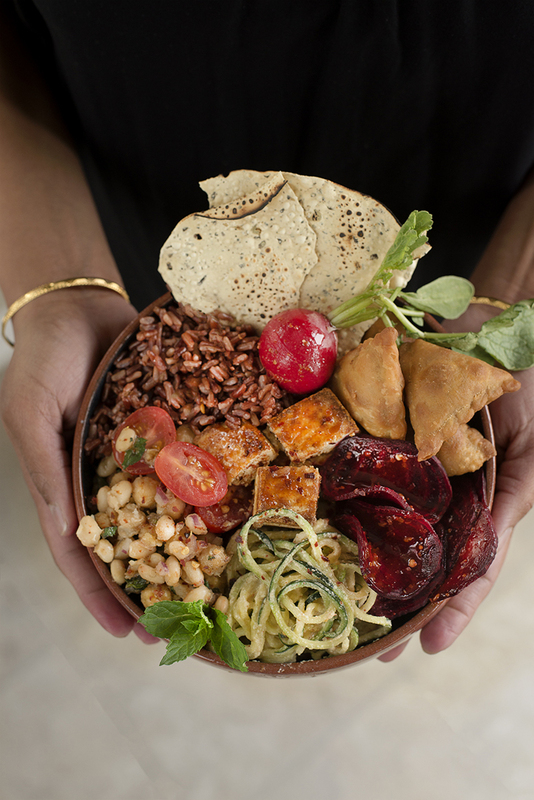 Healthy, delicious, colorful and looks like it is from a gourmet magazine... all in one single bowl - the Buddha / Glory / Hippie Vegan Indian Bowl. Starting from left (picture above). First jar has pickled radish, second cashew sauce, third peach chutney. 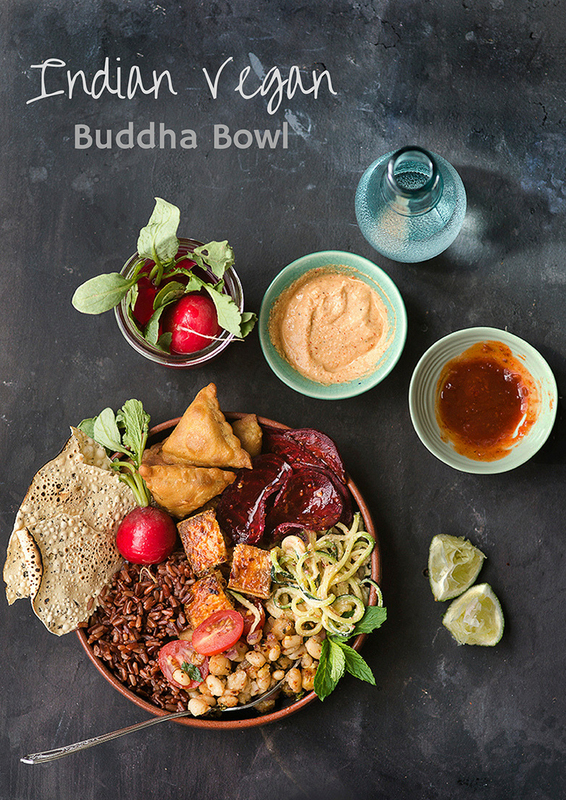 I love the concept of Buddha bowls, as there is so much variety on one plate bowl, also you can get very creative with the ingredients and assembling the bowls. If you are a foodie like me, I assure you, you will love this. Teen who is so fussy with her taste, not picky but fussy with flavor parings and taste, she just loved it. I think that was my biggest victory for the day... to get a 'wow' from a teen. Those of you who have a teen, know what I am speaking about. Just a decade ago it was a look of awe, "mom knows best" and now it is more like, "mom doesn't know" in a decade it will change again :) I'm glad even though mom does not know much, she's somehow figured out, how to make a 'decent' Buddha bowl. lol! 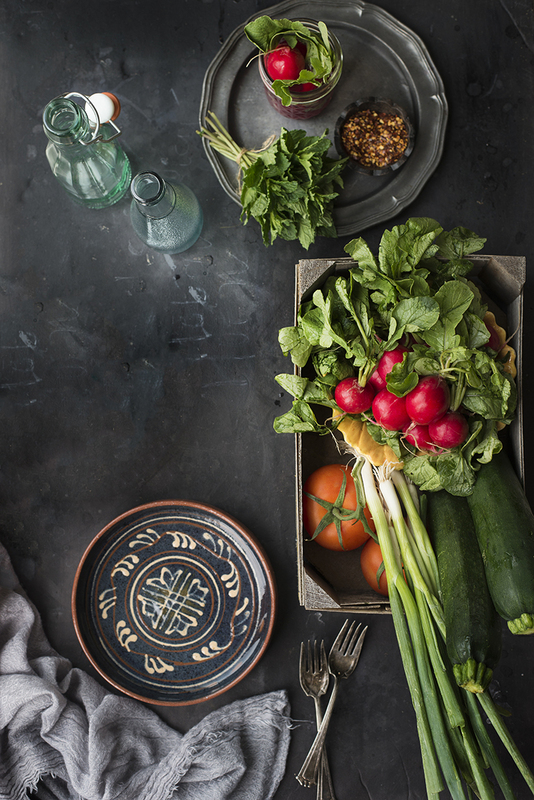 The Buddha bowl recipe does look long and intimidating, but it's not. It's pretty simple when you get to making it. I personally think, writing the recipe is more work than making it. Take the cashew butter or soak the cashew in warm water for an hour and make a paste. 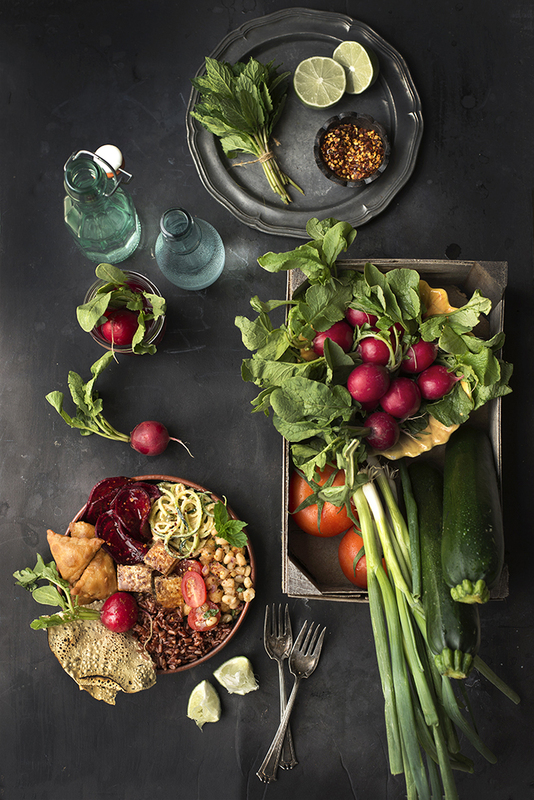 Spiralize the zucchini or cut into thin strips, add the cashew pesto and toss - keep aside. Remove the skin of beets and slice it into thin chips. Take 2 tbsp. peach butter or honey add 1 tsp red chili powder, black crushed pepper, 1/2 tsp. chaat masala, sauf powder, pinch of salt. Toss the finely cut chips in this sauce. Follow the instructions for ready to eat samosa, if you want to make it from basics, here is a recipe. Roast the pappad on flame and break in triangles. Cook red rice, I cooked it in the pressure cooker. 1 part rice 2 parts water, if you are making on open flame, you will need more water. Heat 1 tsp ghee, add cumin, let it splatter add 1/2 tbsp. garam masala and salt and toss it in rice. Soak 1 cup (mix) of chickpea and white bean over night or used canned. I prefer to cook it myself. Pressure cook it - till done. Mix vinegar, water, 2 tsp. sugar and salt, soak radish over night for better taste 3-4 days. Toss it in tandoori masala or garam masala add salt. 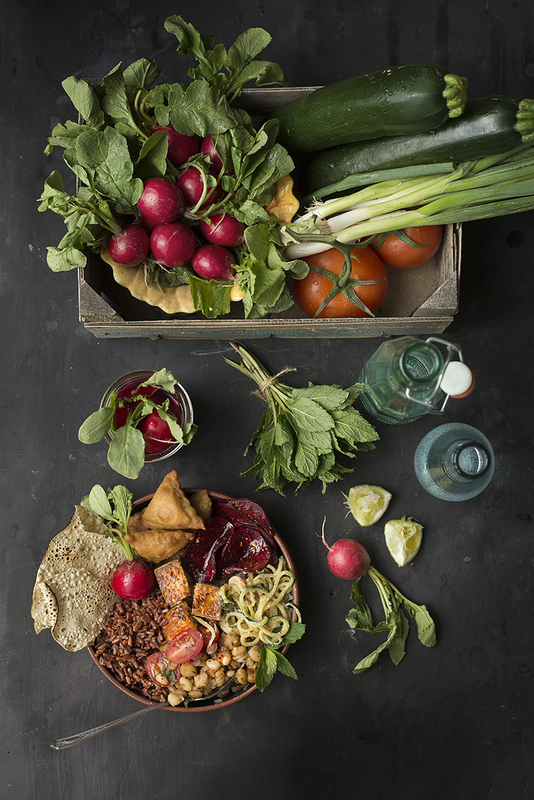 Take 2 bowls and arrange artistically Enjoy!! Again, the recipe looks a bit overwhelming, but when you get down to cook, it's all quick and easy, just that it has various components to it.